Game Day is finally here, it’s two days away. If you’re looking for a delicious dip , this is it. This recipe belongs to my daughter Jenn, she always makes it and it is always delicious. It goes perfectly with any kind of chip , or you can toast pita bread and cut into triangles. I know it’s fattening, but what the hell ? Superbowl comes but once a year right? 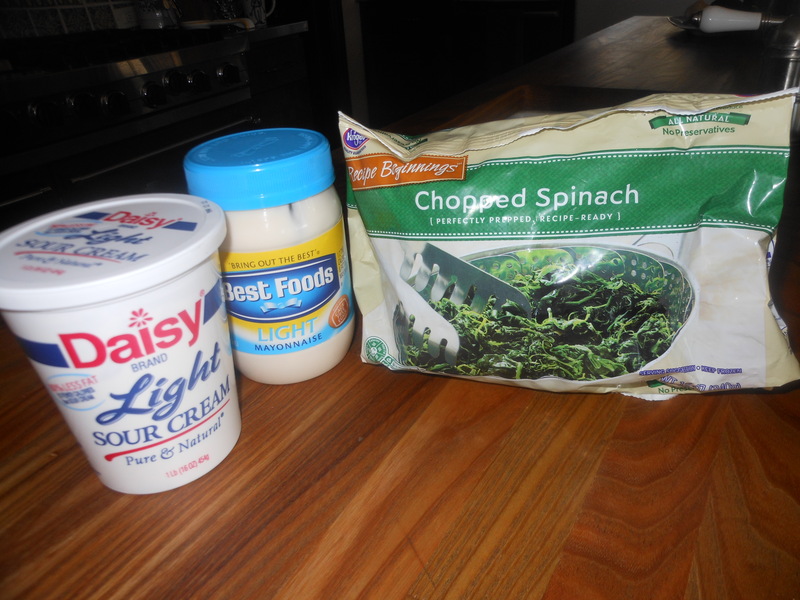 This is a Super Snack, and if you like you can use Lite Mayo and Lite Sour Cream, just not fat free, it won’t work out well at all. This is just a great dip to make anytime of the year, and ingredients are super easy to obtain. Just make sure you squeeze out the excess water from the spinach. 1 box or bag of frozen chopped spinach * (defrosted) drained and squeezed out of all liquid, this is the most important thing here is to get the spinach as dry as possible. * In order to get spinach as dry as possible, I put it in colander to defrost, or leave it out for a few hours. I then literally squeeze it out to get all the liquid out of it, you don’t want it wet, the liquid will ruin the dip. So first defrost, then drain it, then wring it out with your clean hands. Mix together all ingredients and put in a nice oven proof dish that you’ll want to serve it in and bake at 350 degrees till brown and bubbly , about 30 – 35 minutes. This entry was posted in appetizers, vegetarian and tagged appetizer, chopped spinach, delicious dip, Game Day Dip, shredded parmesan cheese, super snack. Bookmark the permalink.